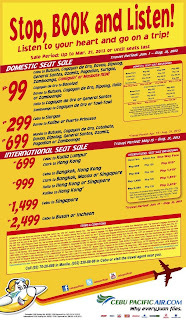 Cebu Pacific, the largest airline in the country announces a new seat sale promo offering as low as 99 Pesos of base fare on selected domestic and international destinations. The promo sis for the travel period May 15 to August 31, 2013. Tickets can be purchase at www.cebupacificair.com or through their ticketing offices. You can also opt to reserve online and pay at the payment centers. 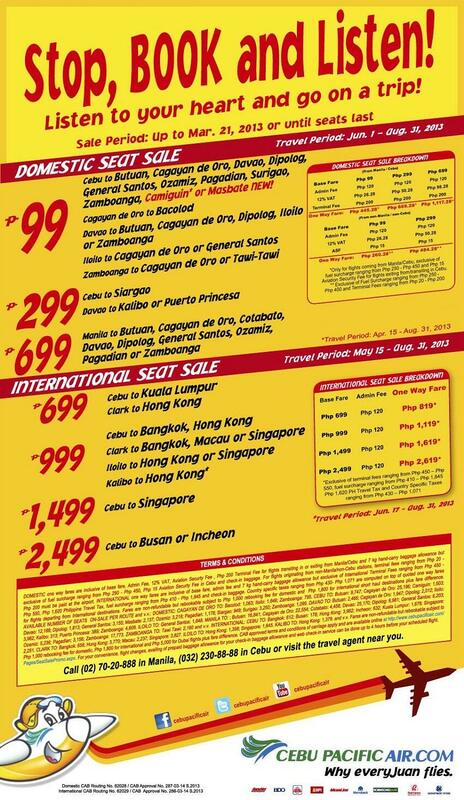 The promo fares are valid until March 21, 2013 or until promo seats last, whichever comes first. Airline promo discounts are based on the "base fare" and is exclusive of other charges as fuel surcharge, taxes, security fees and terminal fee. So, when the promo states, piso fare, it doesn't mean you will only pay one peso. Instead, you will also be charges with Fuel Surcharge which amounts to 200-400 Pesos, terminal fee which can amount 200 Pesos (domestic) and other charges. Please be reminded that umbrellas, tripods and other similar items are not allow to be carried inside the cabin. It should be checked-in along with your baggage. Please be familiar with the terms and conditions of your flight to avoid inconvenience.